Farm-Grown Summer Annuals are ready! petunias, geraniums, bacopa, marguerite daisies, scaevola, osteospermum, and more! Hydrangeas and lilacs are here! New items are coming up from the greenhouses every day, so come on out and see what's new! Succulents are ridiculously easy to grow and enjoy! Click here to watch a great video on getting started with these fun plants! These plants are deer resistant, drought tolerant,and bloom in spring! Do you use fresh herbs when you cook, but don't have room for a full-fledged herb garden? How about a container of herbs that you can snip from whenever you need just a little bit for your meal? Click here to see how to plant a simple herb container! 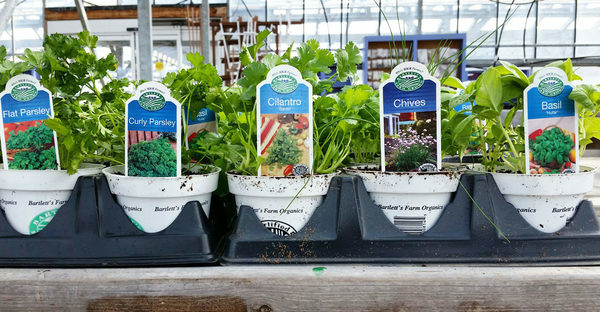 Farm-Grown Organic Vegetables and Herbs are in the garden center! First of all, these varieties are delicious! We no longer have to hide boxed wine at the back of the fridge! These convenient boxes hold 3 Liters of wine. That's the equivalent of 4 bottles! They are easy to buy and carry, plus fewer resources are used in packaging! Imagine carrying 4 or 8 bottles at a time! Also consider cost! This is bulk buying at it's best! The La Nevera wine boxes are $21.99 and remember, that's the equivalent of 4 bottles! For about $66, you can buy a box each of red, white and rose and get the equivalent of 12 bottles. The vacuum sealed pouches inside the box keep the air out after it has been opened and the wine will stay fresh for 4-6 weeks. I can't vouch for this though - it never hangs around that long. If you haven't had any of our farm-made desserts, you need to! Burrata is a classic Italian "pasta filata" cheese that is made by enclosing a center of soft, silky curd in a small sac of mozzarella. The result is a decadent treat that fully showcases the flavor of the milk. The cheese is best eaten within a few days of production, drizzled with olive oil and sprinkled with salt and pepper. Find this and the fresh mozzarella in the market! These reusable squeeze packets might change your life! Cold Brew coffee is rough ground coffee beans that have been steeped with cold water for a period of time. The result is a smoother, less acidic coffee with a sweetness to it. Many people will heat it up to drink, and many drink it cold. Brazilian Mokas Brew... sweet with hints of peanuts, chocolate and caramel. Consider a Bartlett's Farm Gift Certificate that Mom can use for anything at the farm, any time. Does she love plants? A $100 gift certificate will buy enough plants to fill a few containers...or several take out dinners, so she doesn't have to cook! Available in person or on our website to send off-island. you can take a behind-the-scenes tour of the farm where you will see where the magic is made! see how our hard-working crew gets it all done! Tours are held on Tuesdays and Thursdays and are free. For cooks and dishwashers, we are flexible for someone looking for a second job! and try some of the sushi-making supplies in the market!